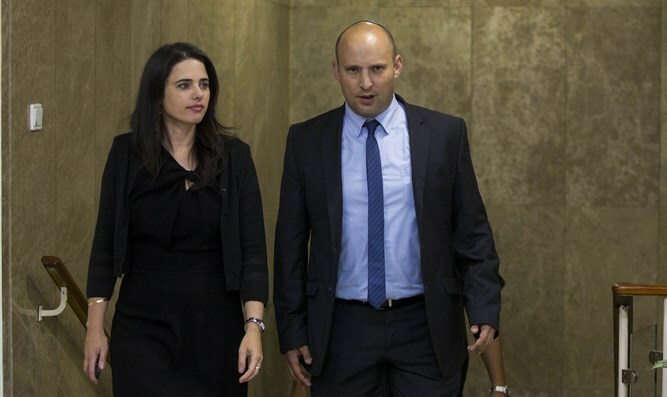 Bennett and Shaked slam approval of 14,000 housing units for Arab residents of Area A which will be in Area C.
Education Minister Naftali Bennett and Justice Minister Ayelet Shaked responded Wednesday to the publication of 14,000 residential units in Qalqiliya at the expense of Area C.
"We objected to the plan called 'carrot and stick,' which was and remains a program of reward for terror and the promotion of the Palestinian takeover of Area C. There is no doubt that the plan's meaning is stringent against the very limited scope of construction approved by the prime minister for Israeli settlements." "The Israeli government must promote Israeli interests in Judea and Samaria, not those of the Palestinians. In light of these implications, we will demand a freeze on the plan until the cabinet can discuss it or marketing of 14,000 housing units for Israelis in Area C [is carried out to balance the Arab building plan]," the two said. The move would double the size of the city, located in Area A, at the expense of land in Area C which was intended for Israeli development. The plan would bring the city and nearby Jewish communities far closer together. At the same time, about 2,000 housing units for Jews were approved by the government a week ago in the entirety of Judea and Samaria. The Jewish population of Judea and Samaria is approximately 450,000.It should be noted that this is a long-term outline - the implementation of which could take up to 35 years - and it has been waiting for about ten years for approval. The heads of the Knesset Land of Israel lobby, MKs MKs Yoav Kish and Bezalel Smotrich, said in response that "this is unreasonable and intolerable behavior that is taking place under the table and we will demand clarification [on the matter." "The construction and allocation of extensive land to Palestinians in Area C, on the one hand, and the limited number of Israelis on the other, crosses the red line that a national government can afford," the heads of the lobby said. The Prime Minister's Office responded by saying that "this is a plan that was brought in by the defense minister last year and approved by the cabinet, and since then, more than 10,000 housing units have been approved for Jewish settlement, and therefore the claim [that the move was taken at the expense of Jewish residents] is incorrect and even absurd."